Protects sensitive ends of cables and cords from damage and disconnection by providing a strong secure enclosure. Quick to install and remove. The JerkStopper Tethering Camera Support removes the stress and strain from a cable or cord, ensuring the plug stays in and is protected from damage. The JerkStopper Extension Lock is an effective locking device for cables and cords that keeps your cable ends protected from frustrating disconnects, damage, and electrical hazards. The simple clam-shell design enables you to simply close the JerkStopper Extension Lock around each end of the cable or cord, and then twist to lock the cords securely and safely together. 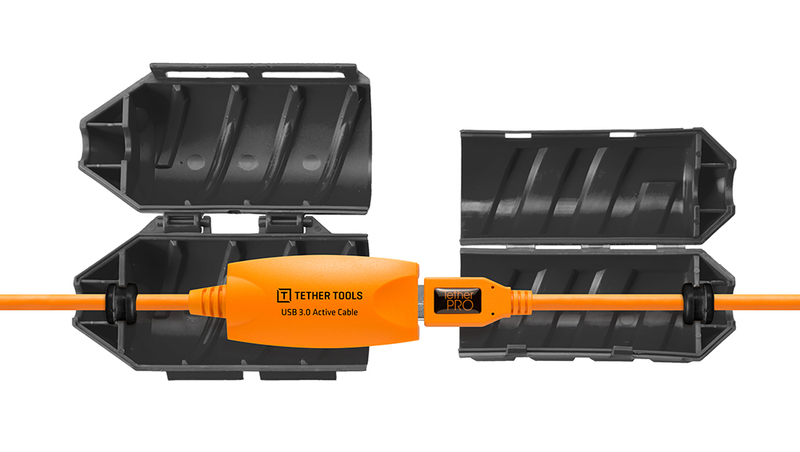 The patented JerkStopper Extension Lock protects the sensitive electronic cable ends and stops unwanted disconnects for USB extension cables, HDMI cables with couplers, and protects power cords for lighting and tools. The JerkStopper Extension Lock comes with two included rubber washers that further protect your cable ends, removing the stress and strain when pulled, ensuring the cable stays connected. On an outdoor tethered photoshoot? The JerkStopper Extension Lock’s hard plastic protective casing can protect cables from the dust, dirt, and physical damage. *Product listing is for the JerkStopper Extension Lock shown in the initial image; cords and cables sold separately. Screw locking mechanism to accommodate various lengths.